This CX Mini Masterclass explains the role of leading and lagging indicators in measuring customer experience. Show host and customer experience expert, Julia Ahlfeldt, shares examples for how you can build a balanced view of customer experience with the right mix of CX metrics and measures. If you are wondering how to move beyond a one-metric view of CX, this episode is for you. When organizations begin monitoring and evaluating customer experience, there is a natural tendency to latch onto one number. Often this number is one of the 3 most popular mainstream CX metrics: CSAT, NPS or CES. These metrics are useful, but they have their limitations, and it’s unrealistic to assume that you can understand the full picture of CX through just these number s alone. Organizations should track and evaluate their CX performance through a number of metrics and measures that can be brought together to create a more comprehensive view. I recommend creating this holistic view through a combination of leading and lagging indicators. So what are leading and lagging indicators? What are they: measures that precede or feed into a customer experience. These should indicate whether or not an experience will be successful. If we think of customer experience like baking a cake, these would be your inputs or ingredients. How can they be used to manage CX: leading indicators help predict the outcomes of experiences and many of them can be measured and monitored before experiences even happen. These can be used to proactively intervene when experiences start going sideways. Additionally, these measures can be leveraged to set department or individual KPIs for teams that operationally contribute to experiences. What are they: metrics or measures that a customer experience. These should indicate whether or not an experience was successful. These indicators would tell us whether or not the cake was delicious and possibly how that impacted our relationship with the person we fed it to. How can they be used to manage CX: lagging indicators help us understand “how we did”. The experience happened and is in the past, but we can use these indicators to evaluate the result and the impact. Lagging indicators are important for monitoring progress (i.e. over time you would want these metrics to improve), and for tracking the impact of customer experience efforts. Lagging indicators such as retention and spend can be especially helpful for tying CX back to business value. Use this template to map your 5 most important leading and lagging indicators. 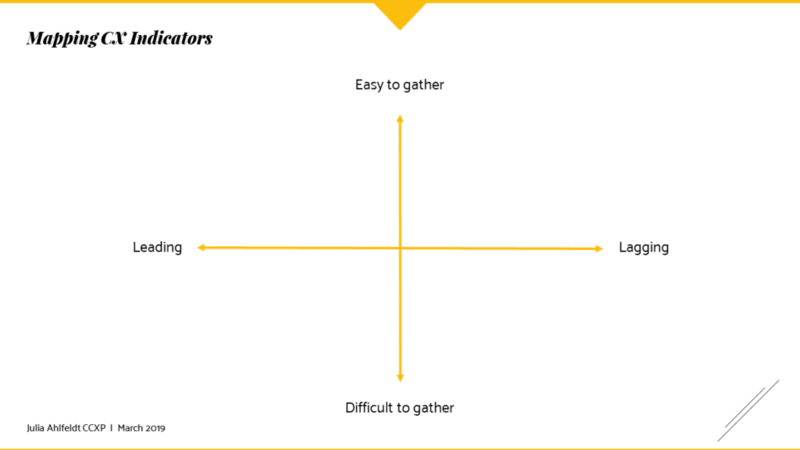 Ease of gathering can help you prioritize. Decoding the Customer is a series of customer experience podcasts created and produced by Julia Ahlfeldt, CCXP. Julia is a customer experience strategist, speaker and business advisor. She is a Certified Customer Experience Professional and one of the top experts in customer experience management. To find out more about how Julia can help your business achieve its CX goals, check out her customer experience advisory consulting services (including CX measurement, insights, leadership alignment and CX change implementation) or get in touch via email.